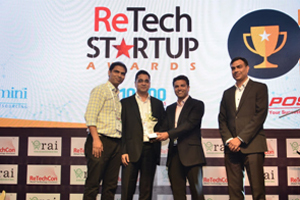 Mumbai, Jun 2016: ShopR360TM recently won the ReTechCon Start-up Award 2016, at the Retail Technology Conclave 2016 (ReTechCon) 2016 event held at Mumbai from Jun 15-16, 2016. ReTechCon is the knowledge-sharing platform focused on technology in retail, instituted by the Retailers Association of India (RAI), the apex body of retail businesses in the country. The event brought together the country’s largest congregation of CIOs/CTOs, technology service providers and experts in the retail technology domain, and introduced retailers to the rapid changes in technology for the benefit of their businesses as well as consumers. The Start-up Awards were the first of its kind organised by the body this year to celebrate the spirit of entrepreneurship and innovation in the retail technology space. This big win in such a prestigious forum reiterates that ShopR360TM video analytics solution is poised to change the brick-and-mortar retail business with smart, “actionable” analytics. “This award comes as an acceptance by the industry that our solution will go a long way in helping retailers bridge the gap between understanding customer behaviour and driving profitability,” said Pranav Bhruguwar, the co-founder of ShopR360TM. “With their daredevil attitudes and unconventional ideas, start-ups are set to really change the fabric of business and the world we live in. The awards are an acknowledgement of this contribution. We hope they inspire more start-ups to dream and dare, empowering Digital India, powering retail,” said Mr Rajagopalan, CEO, RAI.